Mathew Hayman’s 2016 Paris-Roubaix win will be remembered for many reasons, one of them being that it was the first Roubaix won on an aero road bike. Paris/Roubaix, France. The heart rates of most cycling fans will probably still rise when they think about last year’s edition of Paris-Roubaix. Hayman’s return from a broken radius to start his 15th Paris-Roubaix and beat the arguable best cobble classic rider of all time in a sprint still sounds more like a movie script than the reality of modern cycling and will be remembered as one of the greatest editions in the history of the race. A special bike for a special rider- When Mat Hayman will ride his 16th Parix-Roubaix race this sunday, he`ll be on a one-of-a-kind Foil RC. To honor and thank him for this achievement, Scott has created a specific design which is strongly connected to his origin and his love for the “Hell of the North”. The design is the result of a geometric interpretation of the cobble stone vibrations and goes through the whole bike to form a Kangaroo at the side of the top tube. The colors represent the national colors of Australia, but in more “earthy” tones to illustrate the dust, dirt and toughness of the roads of Paris-Roubaix. Within the design on the top tube is a phrase that reflects Hayman’s famous race philosophy “Always keep riding” and is written in typical Paris-Roubaix road signage style. “We used to call it ‘New bike fever’ when I was growing up. That feeling when you get a new bike and you just have to ride it, even as a Pro after so many years a new bike is still something special and to get a personalized one is something I never even thought about,” said Hayman. “For Scott this victory was probably the biggest success in its road cycling history. 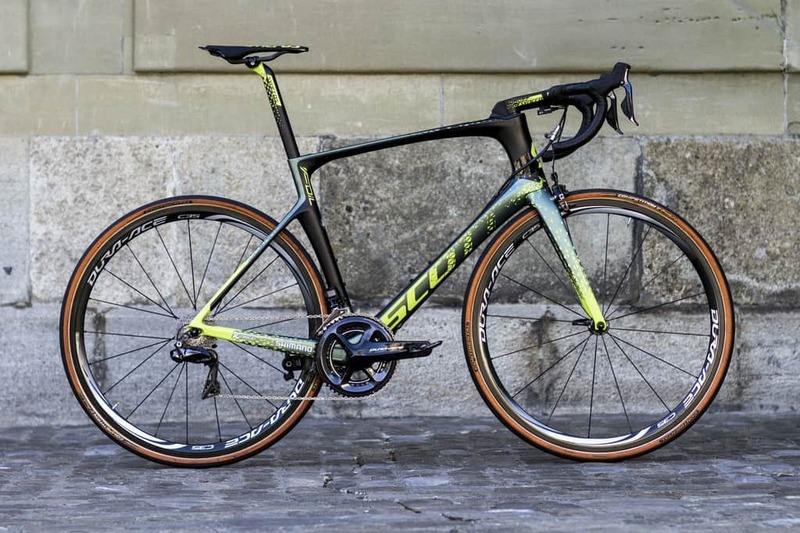 We have won 4 out of 5 monuments, stages and had the leader’s jersey at all three Grand Tours, but the win at Paris-Roubaix is still the tip of the iceberg for me, “ said Pascal Ducrot, Vice President of Scott Sports SA. “I will never forget when I watched the race in front of the television at home and started crying. It was just such a unique race, with a well-deserved winner and therefore I am more than happy to thank him with this special bike,” concluded Ducrot.